Life in prison is a nightmare for those who commit crimes. Imagine what it’s like for those who don’t. Alan Gell and Darryl Hunt can tell you. After years under lock and key in North Carolina for crimes they did not commit, both men were recently released from prison. Mr. Gell won his freedom after nine years through acquittal in a retrial. The retrial occurred in part because vital evidence pointing to Mr. Gell’s innocence was withheld by the prosecution during his original trial. That trial led to a death sentence for Mr. Gell. 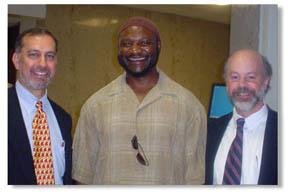 2003 thanks to the efforts of a legal team that included lead attorney Mark Rabil (left) and Assistant Appellate Defender Ben Dowling-Sendor. Darryl Hunt didn’t receive a death sentence, but he did lose eighteen years of his life to the Department of Corrections before, with the help of a tireless defense team, being fully exonerated in February of 2004. Meanwhile, the real perpetrator, the man who raped and murdered the young victim, was free – to commit other crimes. The North Carolina Center on Actual Innocence, which coordinates the Innocence Projects' North Carolina law schools, is dedicated to uncovering the facts about cases that careful review tells us are likely wrongful convictions. Wrongful convictions can be caused by a myriad of factors: mistaken eyewitness identification, the use of jailhouse “snitches,” prosecutorial misconduct, ineffective representation by defense attorneys, even false confessions. With the help of law and journalism students and Innocence Project faculty advisors, we painstakingly analyze case materials, talk to witnesses and work with inmates to determine exactly what went wrong and what we can do to restore an innocent person’s freedom. The Center is also dedicated to promoting systemic reform that will greatly lessen the chance that an innocent person will be charged with a crime, much less convicted. To that end, we organize educational forums and act as a resource for the media. Center members also actively participate in national and statewide policymaking initiatives. While people of color and those with few financial resources are more likely to be wrongfully convicted, no one is exempt. We hope this website will serve to bring the problem of wrongful convictions, as well as its solutions, to the forefront of people’s minds. We can all make a difference - the first step is to become informed.